The scientific techniques used to work out the affinities of animals only known from fossil remains have developed greatly over the last 150 years yet the answer to this question still seems far from being resolved. For many years, I’ve joked with colleagues that we need to make a lever like this to put in front of the Grant Museum’s Archaeopteryx cast and change it every time that a new paper decides one way or the other whether or not Archaeopteryx is a bird or not. I may pop down to the Institute of Making one of these days to turn this plan into a working prototype. You’d think it would be easy to determine one way or another from characters shown in the dozen or so fossils of Archaeopteryx but here’s a breakdown of various authors’ designations of the animal. You’ll spot a few of the heavy hitters on the list. As I mentioned above, everyone’s had a punt at answering this question over the years. This information is largely sourced from UCL evolutionary embryologist Sir Gavin De Beer’s 1954 monograph on Archaeopteryx printed by the British Museum (Natural History) as it was known then. I’ve added links to biographies for some of the well known names and the more recent additions I’ve cobbled together myself. Archaeopteryx, bird, non-avian, non-mammalian reptile or something else? 1857 The very first Archaeopteryx specimen, the Haarlem specimen is identified as a pterodactyl and remains so until 1970. 1861 J.A.Wagner, reptile. H. von Meyer, bird. There was disagreement straight off the bat, Wagner described the first skeleton as a feathered pterosaur. 1862 H. von Meyer, bird. H.Woodward, bird. A. Oppel German Palaeontologist with a bit of the moon and a shrimp named after him, bird. 1863 D.F.Weinland, intermediary between reptiles and birds. R.Owen for it is he!, bird. J.D. Dana, bird. A. Milne Edwards, a bird related to chickens. 1866 E.Haeckel, bird. O.des Murs, a swimming bird. 1868 T.H.Huxley, bird (two papers this year). J.V.Carus, bird. 1870 A.R.Wallace beating Charles Darwin to the punch (see below), bird. 1872 C.Darwin for it is he! bird. C.J.Sundervall, bird. 1878 C.Gegenbaur, intermediary between reptiles and birds. R.Widersheim, intermediary between reptiles and birds. 1879 E. de Selys-Longchamps, reptile. C.Vogt, intermediary between reptiles and birds. E.Haeckel, bird. H.A. Nicholson, bird. 1880 A. Reichenow, intermediary between reptiles and birds. O.C.Marsh of ‘bone wars’ fame, bird. 1881 L.Dollo of Iguanodon and Dollo’s law fame, reptile. O.C.Marsh, bird. H.G.Seeley, bird. 1882 T.J.Parker, intermediary between reptiles and birds. 1883 R.Widersheim, intermediary between reptiles and birds (a second time). M.Fürbinger, bird. 1884 R.Widersheim, intermediary between reptiles and birds (third time lucky). R.Hoernes, bird. W.Dames, bird. W.A.Forbes, bird. 1885 R.Widersheim, intermediary between reptiles and birds (fourth time’s a charm). H.Woodward. Bird. M.Fübinger, bird. Fr.Aug.Quenstedt, bird. A.Newton, bird. B.Vetter, bird. G.Baur, bird. A.Pavlow, bird. 1886 R.Widersheim, intermediary between reptiles and birds (fifth time of trying). 1887. G.Baur, changing his mind from 1885, intermediary between reptiles and birds. M.von Menzbier, bird. 1888. M.Fübinger (a third paper), bird. 1908 W.Branca, intermediary between reptiles and birds. 1938 B.W.Tucker, a bird close to the true line to birds. 1946 G.G.Simpson, a bird in the true line to birds. 1954 G. de Beer, bird. 2000 T.R. Holtz Jr., bird. 2001 M.A.Norrell, J.M.Clark & P.J.Makovicky, bird. 2007 A.H. Turner, D. Pol, J.A. Clarke, G.M. Erickson & M.A. Norell, bird. P. Senter, bird. 2008 F. Zhang, Z. Zhou, X. Xu, X. Wang & C. Sullivan, bird. 2010 X. Xu, Q.Y. Ma, & D.Y Hu, bird. 2011 Xing X, Hailu Y, Kai D & Fenglu H, not a bird, a Deinonychosaurian dinosaur. Barret, P, bird. 2012 M.S.Y. Lee, T.H.Worthy, bird. 2013 M.R.Spencer, E.Wilberg, maaaaaaaaybe a bird depending (and the subject of the original To bird or not to bird blog). This list is by no means complete and the missing 30 year gap and a key period in dinosaur/bird palaeontology contains hundreds of references plumping for either bird or (non avian) reptile but you get the idea. Archaeopteryx has always been a contentious animal. Here we’re looking at whether it’s a bird or not but other areas of discussion are whether or not it was the first bird (dependent of course on whether it is a bird or not) and the flight capabilities of the animal. When it comes to the idea of scientific consensus, Archaeopteryx nicely highlights that even for a species studied so intensely over the last 150 years there’s far from a cut and dry consensus, although there are a higher number of authors going for bird in this extremely limited data set. Returning to the original question. Is Archaeopteryx a bird or not? The ‘answer’ currently is tentatively probably yes but we’ll see what the next 150 years of research has in store for the original transitional fossil. Beer, Sir Gavin De. 1954. Archaeopteryx lithographica, a study based upon the British Museum specimen. London : British Museum, Natural history. Xing, Xu., Hailu, You., Kai, Du & Fenglu, Han. 2011. An Archaeopteryx-like theropod from China and the origin of Avialae. Nature 475, 465–470. Hi, Could you give a full ref of the Tornier 1925 title? I’m pretty sure this must be Gustav Tornier, but I haven’t seen the article. Of course, “reptile” is paraphyletic… so it should be understood to be close the base of the Aves clade, and either included or not. I think it should be. The full ref is TORNIER, F. 1925. Ueber den Erinnerungstag an das 150-jahrige Bestehen der Gesellschaf. Ruckblick auf die Palaeontologie, III. Sitzungsberichte der Gesellschaft Naturforschender Freunde Berlin. 1925: 75-6. Which should be Gustav Tornier. Oddly De Beer references this paper as F.Tornier (and I’ve replicated that here). Did he go under another name or is it just a typo? The question itself is misleading since it depends entirely on how each author chooses to define the word “bird”. Is Archaeopteryx a member of the crown group Aves? Definitely not. 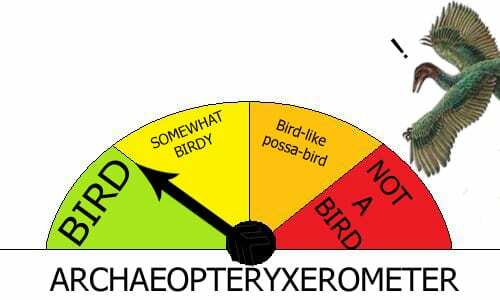 Is Archaepteryx closer to Aves than to Dromaeosauridae? Probably, but this is currently hard to resolve. Does Archaeopteryx have feathers? Definitely. Does Archaeopteryx have powered flight? Controversial. There can never be a meaningful answer to the question before we agree on what we’re asking. Hi Matt, the difficult nature of the question is exactly what I wanted to highlight. Where commonly used terms which get most people by, clashes with taxonomic and systematic positioning it can be confusing. In the attempt to shape these analyses into news articles or short journal papers this mismatch results in what seems to be the perpetual de and re-perching of Archaeopteryx. And as your questions highlight reaching a definitive answer or consensus isn’t as straight forward as is often conveyed in science. I’m sure that many of the scientists above were confident of their analysis at the time. It seems that looking into what Archaeopteryx is or isn’t has done more for the reorganisation of Aves (all four ways this term is used) than it has for the ‘true’ positioning of the animal in question. That settles the question then. Archaeopteryx is a fulcrum.